I read this article and found it very interesting, thought it might be something for you. 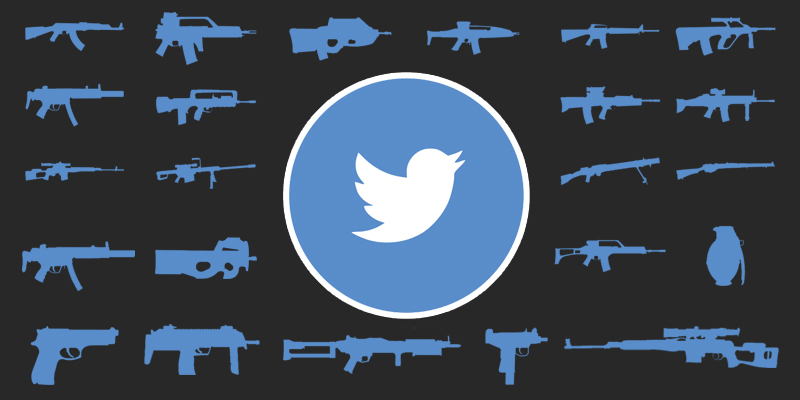 The article is called Automatically Finding Weapons in Social Media Images Part 2 and is located at http://www.automatingosint.com/blog/2016/03/osint-twitter-api-automatically-finding-weapons-in-social-media-images-part-2/. In the first part of this series we examined how to write some code that can slice and dice an image and then submit it to Imagga. By examining the tags that come back we can make a fairly accurate guess as to whether there is a weapon present in the picture. Now we get to do the fun part of hunting through Twitter to try to find the images. We could build a really extensive crawler to just roam around Twitter but what I want is a more targeted tool where we can point it at an account and have it retrieve all of the photographs for that account. You can easily extend the script to go much deeper if you like (such as friends and followers), but I will leave that as homework to you the reader. Let’s get started. 2. 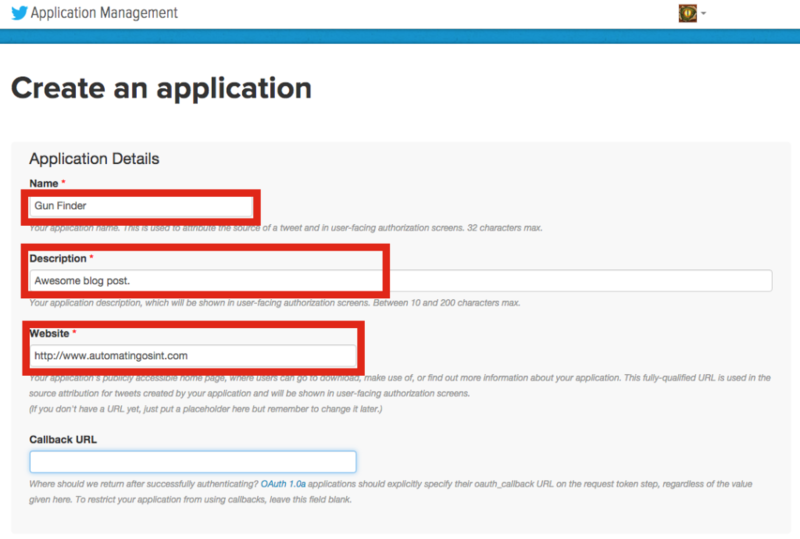 Give your application a name, a brief description and a website. 3. 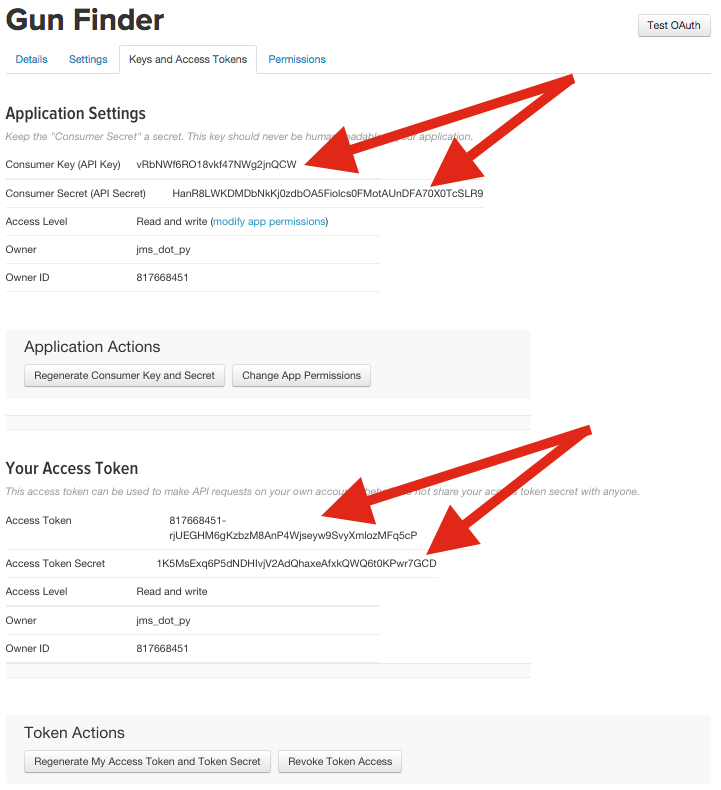 Once your application is created click on the Keys and Access Tokens link to start the API key generation process. 4. The first thing you need to do is generation an access token. 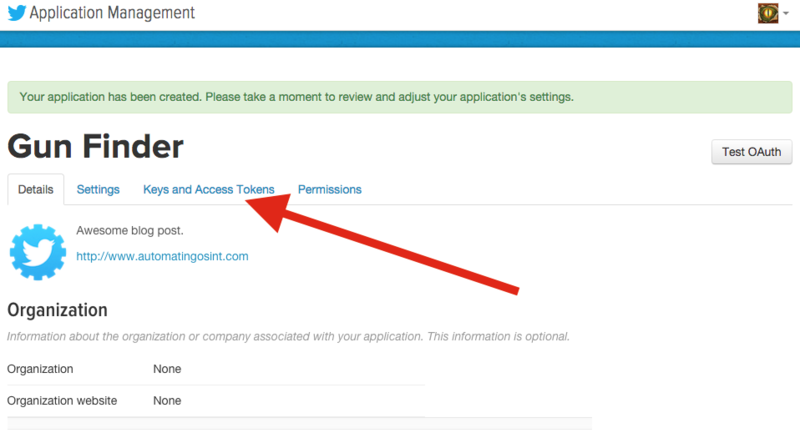 Click the Create my access token button. 5. Now you can use the Consumer Key, Consumer Secret, Access Token and Access Token Secret in the Python script that we are going to be developing. WARNING: Do not give your keys or tokens to anyone. This can mean someone can hijack your Twitter account or perform actions on your account that you most definitely don’t want them to do. I have just kept them in place for demonstration purposes. If you don’t know how to use pip yet, then watch my how-to videos or sign up for one of my free webinars. Line 32: we define our download_tweets function that takes a screen name (username), and a max_id parameter. We’ll cover how the max_id parameter works later. Lines 34-39: we build our Twitter API url that will pass in the desired screen_name and request 200 Tweets each time the API is called. Line 42: we send off the request to the Twitter API. Lines 44-48: if we receive a response back successfully (44) we then parse the JSON (46) and return the list of Tweets back (48). Now that we have the initial function that will retrieve Tweets, we need to implement a loop that will continually call this function to retrieve all of the Tweets in a users’s timeline. This where the max_id parameter will come into play, as we will need to “page” through results as we download 200 Tweets at a time. The maximum number of Tweets that we can retrieve from a timeline is 3,20o. Line 60: we define our function download_all_tweets to receive the Twitter username (also called a screen name). Line 65: we do our first request for 200 Tweets for the target account. Line 71: we snag the last Tweet in the list so that we can use it as the maximum ID for future requests. This is how we page through results, by continually telling the Twitter API to give us Tweets that are older than the max ID we pass in. Line 74: we continue to make requests as long as we have older Tweets to retrieve. If we run out of Tweets or max out at 3,200 these two values will be the same and the loop will exit. Lines 76-84: we add the new Tweets to our full_tweet_list (76) and again grab the oldest Tweet’s ID (79). 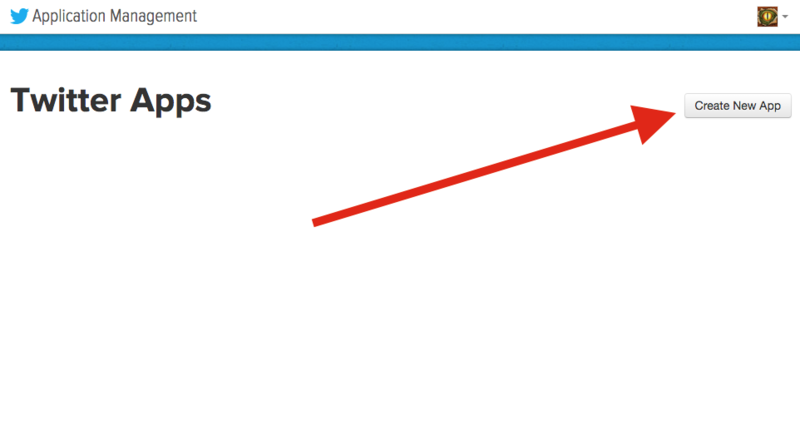 We sleep for 3 seconds (84) to make sure we aren’t violating the rate limiting on the API. Line 87: we run another request, this time passing in our max_id variable minus 1. This ensures that we don’t get overlap between our oldest Tweet in this list, and the newest Tweet in the next request. Lines 90-91: if we receive Tweets back (90) we again grab the oldest Tweet so we can examine its ID. Lines 95-98: we store the last set of Tweets we received from the API (95) and then return the list of Tweets. Line 228: we are commenting out our old call to the detect_guns function as we’ll use it later on. Line 230: we make our initial call to download_all_tweets passing in the target account identified in the first part of this article series. Lines 234-235: we check if we have a gunphotos directory present (234) and if not, we create one (235). This is where we will store our matched photos. # now test for guns! Lines 240-244: we walk through the list of Tweets (240) and check if we have embedded media in the Tweet. Line 246: we then loop over all of the pieces of media that are attached to the Tweet. Lines 252-254: we make a request for the photo itself (252) and then extract the filename (254) once we have successfully downloaded it. Lines 257-259: we store the photo on disk. Line 262: we now ship the photo off for Imagga tagging, using our previously developed detect_guns function. Lines 264-267: if we did not detect a weapon (264) we remove the file from disk (265). This allows for us to determine whether an image matches or not so that we can either keep or delete a photo. Now for the fun part! [*] Finished! Checked 64 photos and detected 2 with weapons. Awesome, so you can see the script retrieve all of the user’s Tweets, and then begin systematically working through each image (including preview images for videos) to test which ones have weapons. 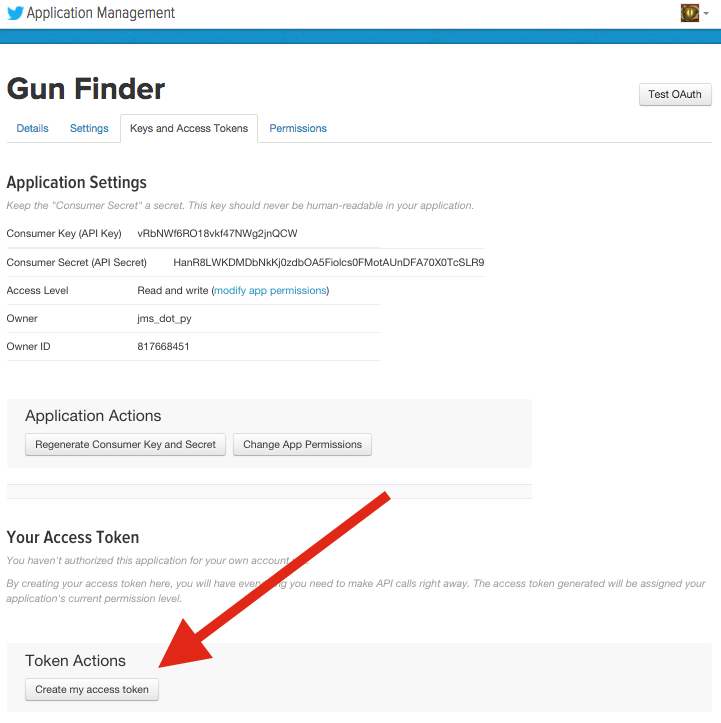 You can now go check the gunphotos directory and see the results. Well done! You can of course now test some other accounts, or take a look at how to expand the script using the Twitter API. Want more Python and OSINT? Join my mailing list now and don't miss out!